This tutorial will show you how to stop the “Verification Required” message on iOS, either when downloading free apps or app updates on an iPhone or iPad. Additionally, we’ll teach you why you might see the ‘Verification Required’ popup message in the App Store, and also how to check what is causing that message to appear in the first place, and of course you’ll learn how to fix that message so that it no longer appears. Read on to learn more! If the outstanding purchase is not something you are interested in, you can also attempt to contact Apple for a refund on that balance due. Regardless of whether you pay the balance with updated payment information, or have it canceled, you must clear the due balance on the Apple ID to be able to fix the “Verification Required” message on the App Store for iPhone or iPad and then you can select the ‘none’ payment option. * Whether or not you choose to update payment information associated with an Apple ID is entirely up to you. If you’re using the App Store without a credit card then you’d want to choose the “None” option, which allows updating and downloading free apps without ever needing any sort of verification of payment or even a payment method at all. Or if the payment method has expired, you can choose “None” too and bypass the ‘Verification Required’ message that way as well, and then later go back and update the payment details if need be. Keep in mind if you have an unpaid balance on the Apple ID for a purchase, subscription, etc, you must pay that balance before you can choose the “None” option or before you can stop the Verification Required billing message. Now you know how to stop “Verification Required” when installing apps in iOS, it works for free apps, updates, and paid apps too. I’ve seen this error on kid devices before. Setting up an Apple ID with no payment system, like for kids, is a good idea to avoid these situations. For a personal device, you’ll almost certainly need a payment method attached because iCloud free storage is so minimal that it’s unusable without paying more. This is particularly annoying when you buy someone an iPad or Mac as a gift, because then you’re buying them a new bill to their existing bills. What kind of gift costs someone money? Ugh. I do find it insulting to spend so much money on multiple Apple products and then have to pay even more to use iCloud which is deeply integrated into everything. And then Apple Music and iCloud Music are two additional separate purchases too? Give me a break, nickel and dimed. How about including them all in the same fee for $10/month? Infinite iCloud storage, infinite music. Apple should make it simple. But Apple today is shareholder centric, so is having a billion revenue streams their goal rather than user satisfaction? You will find several payment choices in the Payment section of the Apple ID settings. Options are: Credit Card, Debit card, Paypal, and “None” – you must choose the “None” option in Payment settings if you want to get rid of the payment method entirely. If you can not select “None” it means there is an outstanding balance owed on the account which must be paid before you can choose “None” as the payment option. Hi I was able to follow all the steps but None wasn’t an option for me to click on. There was only my current card and paypal. Those were the only two options None wasn’t. Please help. I have had similar issues, one where, randomly, it would pop up asking for me to enter my password for my apple ID, it was often and very irritating. Come to find out, when I went into my Apple ID account, either the security code or the expiration date on the card was needing to be verified. Once I completed this the pop-ups stopped happening. I think there is a time limit on the account, if you don’t log in for so many months or don’t purchase for so long or some unknown thing, it will “forget” something about your card and need verification, perhaps to make sure you are still you, I guess. (I hate this crap). Another thing that can happen is if you get a new card from your financial institution, you need to remember to update your Apple ID account. ALSO: another way to load your account is with an itunes/app store gift card. This is my preferred method, as you can typically get these at 10-15% or even 20% off. If you cannot select “None” than you either have outstanding amount owed, or, active subscriptions (this is a guess). I don’t think you can select “none” if you have active subscriptions with a $0 balance. You need to either cancel those subscriptions or add to your account balance (see my other comment about using iTunes/app store gift cards). Same here, have the Iphone SE with all the newest software updates. When I select None, it says that “this type of payment is not accepted on this device.” I have a Visa Gift Card with no money on it on my account and it won’t let me get rid of it. What do I do? Mine still shows as well, I am part of a family and I am not the head. As far as know we never bought an app before however I do remember a time my dad tried to download an app which cost money and he might’ve put in his credit card details but it failed so he stopped the process… Anyways that time might be the reason for all my troubles including this message when I try to download a free app. tried to follow this website’s instructions and i succeeded up until step four where I don’t have the option for “Payment Information”. I then assumed that this might be because I am part of a family and then went to “Family Sharing” (Under Apple ID) and found a section called “Shared Features” I then went to “Purchase Sharing” and got to the option where I could turn off “Share My Purchases” and Ask To Buy” (which is automatically turned off – no option). I then found your comment and followed the steps and because I am part of a family I can’t deactivate it and also becuase I have never bought anything with my device I do not have any card details nor shipping adress… Please help! I have this same problem. I am part if a Family, can’t deactivate Purchase Sharing and do not see “Payment Information” on my setup options. All I want to do is download a FREE app without putting in a credit card number. Anyone have an idea of what to try next? I followed the steps on my iPhone X and I was able to select none and it didn’t work. I also did all the steps, waited for 24 hours, turned the phone off and on and but still get the verification message. My payment method has changed to ‘None’, but ‘Verification Required’ still show when I try to install apps from appstore. This method is not working for me it still makes me verify then after I do what it says then press done it makes me do it all over again and won’t let me get the app I want. I need to get this app now and it won’t let me I’ve tried everything, please help me by replying back please! I am also getting this message. My payment method is set to none. I am trying to update 16 apps, and it keeps trying to verify my billing, and when I do, it won’t do the update. I checked and my Apple ID balance is $0.00. My software is updated to iOS 11.3. I did this and it still pops up and won’t let me download anything or update any of my apps. I’ve had this problem for weeks and no matter what I do, I even tried adding a $10 gift card on and that’s there and it’s still telling me to verify. It’s annoying, it will let me download brand new apps but not to download ones I have had previously or it won’t let me update. Someone please help me fix this. I had this same problem, and I then chose “none” as a payment option, and it still brings up that verification required box when I try to download free apps or update apps. Please Help!!! Yeah, switched it to “none” it still didn’t fix the issue! Get it together and fix this problem PLEASE!!!! Same as all of you change to nine and still can’t update anything. Same here – all steps- all good – no downloads .. I have used this procedure several times, and, no matter what, it still continues to tell me to verify my billing information. I can no longer download anything at all or even update apps. i don’t have the option “none” either and can’t download, purchase, or update applications. The only fix for me was updating my credit card information. I’ve tried othe suggestions and nothing worked until updating my credit card info. Your solution is BS! It doesn’t work! I had same problem where None was selected and it still required verification. The way I fixed it was to add a valid credit card, then when it accepted it, I went back in to iTunes and followed the steps to select “none” and it worked. I’m frustrated that they forced me to add a credit card even though I will never use it on iTunes. I did not want to trust them with my information and them forcing it on me makes me trust them less. Tnx Craig! it worked for me. I know how awful it is because I faced the same experienced as you guys. I tried my best to fixed it. I got one solution make sure that you put the right apple id that you download the apps. I change my apple id so it doesn’t work then I put again my old apple id then it works, hope this helps …. I followed all the steps and set it to “None” but it STILL ask for a payment method, this is very annoying. Can someone help me? Yep. Followed the instructions it still does not work. 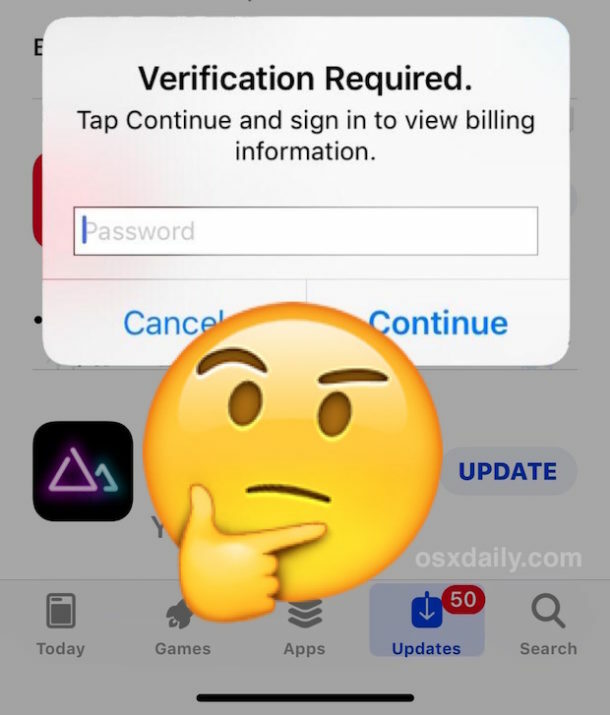 Susy as the article states, if you see the “Verification Required” message when trying to download apps on App Store for iPhone or iPad, it is probably because you have an outstanding bill that must be paid. You can not select “none” as the payment type if you owe Apple money, like for iCloud, an App, in-app purchases, subscriptions, etc. You would have to cancel those subscriptions and pay the bill first, then you can select “none” or update the credit card information to something else. Pay the due bill, then change the payment type, that worked for me. I did this AFTER I got charged $6.99 for an update on a FREE APP!!! Free apps are free, though sometimes free apps can have in-app purchases that charge for features. If you buy something in a free app, then that purchase is obviously not free. Personally I find the in-app purchase phenomena within a ‘free’ app to be disingenuous, but they are very popular and profitable for app developers particularly for games and the like. I personally would rather buy an app one and own it outright, anything else is closer to rent or a lease with constant payments in my opinion. Tried changing to “None” on payment option. Still requires verification. So aggravating especially when my son is wanting free apps. There seems to be some confusion in the comments here. You must select “None” as payment method to get rid of the “verification required” message in iOS. – First pay off any existing bill with Apple, for iCloud, Apple Music, iTunes, apps, etc. That will enable your child to download free apps only, any paid app would require a credit on the account or a password to perform the payment assuming a payment method is attached to that Apple ID. Also any future paid download will require a payment method. That includes in-app purchases. If you can not select the “None” option it is because there is an outstanding bill due on the Apple ID, or there is a subscription active, or some other purchase going on, whether from iCloud, in-app purchases, Apple Music, iTunes, subscriptions, etc. Found the problem, the problem was a subscription with auto recurring payment turned on. I had to pay the bill first to solve the problem, hope this help solve your problems. Great thanks for that Tim, I am removing the link since it’s basically just a video copy of the article written above. Ok so I’ve literally tried everything. When I go to try and set it to none it won’t let me and it won’t let me set require password for free downloads to no. An I’ve checked if I had any outstanding payments and I don’t everything is 0.00. Nothing has to be payed. Could i have I virus or something? I know it’s not my card cuz I’ve checked and my card is still valid. Is it my phone? I’ve even tried completely hard resetting my phone. Please help! I chose the none option and clicked done went back to the App Store and it was still asking for verification. I went back to the payment method in settings and it was still on none but it still asked for verification. No Adam, that is not why you see the “Verification Required” message. Why you see “Verification Required” is because there is either one of the following: there is an outstanding bill on the account that is unpaid, the payment information is outdated, there is a subscription service or some other in-app purchase in existence that is not able to charge because of a billing issue. It is always a billing issue that must be corrected, either an outstanding bill or payment information needs updating. You can choose “None” as payment type once you pay off the outstanding balance. So I’m able to click on “None” as a payment, but after I click None, it still says I need to verify. There is a bill on there but I never meant to buy anything. How would I get a return? Or a cancel on whatever it is I bought? Thank you so much. You are a genius and a life saver. I had to click ‘None’, essentially clearing the previous payment setup. When I again attempted the iTunes purchase, it prompted me to set up the payment link and, voila! Thanks for the article! Kindly do the needful.ASAP…Thank you . This sh*t don’t work, I tried it like 12 times and it ain’t working. How do I fix this pease of sh*t.
i’m getting really frustrated because i can’t do anything!! I cannot select ‘none’ as it asks for verification to proceed to apple ID? So I select d none in the patent option it still won’t let me update my iPad without a payment in file and I’m not doing that when it’s for my kids! This message came after I downloaded ios 12 yesterday. It worked fine, no problem until I tried to download an app and got the verification message, I checked, there were no outstanding bills there and it updates other apps just fine. Could this be related to ios12? Just got the iPhone 8 Plus and this is going on what a waste if your “information” about fixing this ain’t gonna work first thing in the morning I’m returning it and getting the galaxy 9 because it has no issues like this. After all steps still got the verification required message. Can you help?? Hey. This was very helpful except I sighed up before and did all this. At present my setting are on none for the payment information. But yet I still get verification required method. I tried putting a valid credit card but still it just goes back to the original settings. I think something is wrong with my phone right now actually. I tried all of your suggestions. Nothing has worked. Thank you. Tried everything else without success, but selecting “none” for payment method, saving, then going back to selecting PayPal worked like a charm! I’ve tried everything, My iPhone XR will not save changes to billing information, and it seems to have an old visa # old contact info stored. I am unable to download any apps. Very frustrating!! And when I say solve I mean also to avoid paying what you owe but still be able to update the app that needs updating especially an app that you use a lot. 5. Once you click on the app you wish to update, Click on the Offload App. 6. It will be reinstalled from your device but NOT REMOVED. 7. Then press home, where ever the app is located, click on it to RE-DOWNLOAD the app but this time once downloaded, it will be the updated version. This is accurate for ANY iCloud account that has a pending balance on their account. Hope this helped! Because it sure helped me. Had to play around with the system for a bit but everything has a loophole. Leave any questions or comments. I’ll get back to you when I can. « Make a SuperDrive Work on Unsupported Macs? It’s Possible!